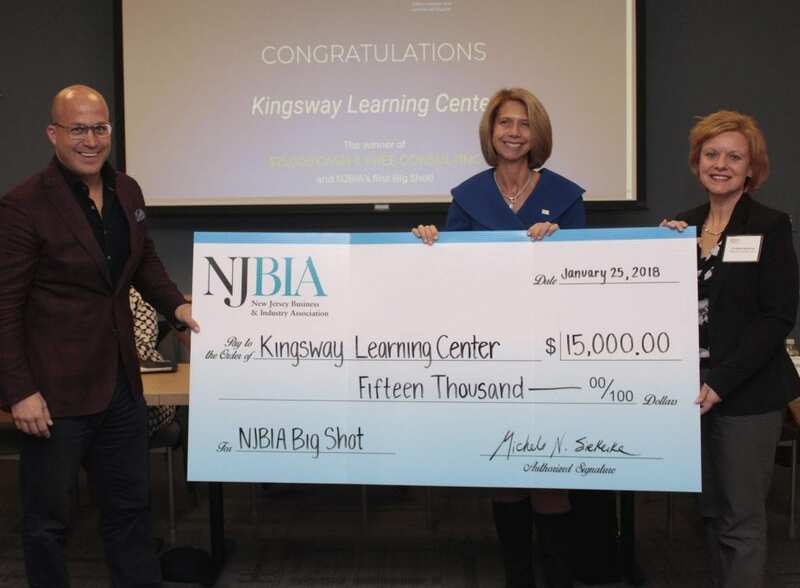 The New Jersey Business & Industry Association presented Big Shot contest winner Kingsway Learning Center with a $15,000 check today, while the South Jersey non-profit also received the start of free consulting from contest partners at NJBIA headquarters in Trenton. Kingsway Learning Center, which offers special education services to better meet the needs of children and adults in Haddonfield and Moorestown, was announced as the winner of NJBIA’s online video contest judged by member panelists earlier this month. “It’s our great pleasure to present these winnings to Kingsway Learning Center today, as we know they will put them to great use,” said NJBIA President and CEO Michele Siekerka. A video link to the presentation of the $15,000 check to Kingsway Learning Center by Siekerka and contest partner Mike Luzio, of the LVE Group, can be found here. “We are thrilled to have been selected as the winners of the NJBIA Big Shot Contest,” said Kingsway Learning center CEO Christine Robinson. “We know it must have been a very difficult decision for the panel with so many worthy applicants. Jersey Girls Food Tours: A unique, Jersey City-based service that introduces local restaurants and chefs to the public via guided tours throughout New Jersey. SERVPRO – A SERVPRO franchisee serving Atlantic City, Hamilton and Hammonton in Atlantic County and Haddon Heights and Voorhees in Camden County specializing in the cleanup and restoration of residential and commercial property after fire, smoke or water damage. Following the presentation of the $15,000 check today, Kingsway Learning Center was provided consultations from participating NJBIA member businesses which voted on the winner. They include: Laura L. Ditommaso, Smolin Lupin & Co.; Thomas Foschino, Arch Insurance; Sandra Seastream, Direct Energy; Angelo Mendola, Priority Payments Local; Harvey Mishkin, Association Master Trust; Jeffrey J. Corradino, Jackson Lewis; Leon Grassi, The DSM Group; Mike Luzio, the LVE Group; and Sivaraman Anbarasan, The New Jersey Community College Consortium.